What we often consider to be “clean” is NOT a natural state. In order to maintain clean and healthy facilities, there must be a concerted effort to continually remove soils, bacteria and germs from all hard, non-porous surfaces. The reason we do this is two-fold: to improve the appearance of a facility and to remove harmful materials that are likely to cause illness. The term “clean” is generally used for the removal of visible dirt and dust from a surface. When it comes to removing potentially harmful materials there are two standards as recognized by the EPA: Sanitizing and Disinfecting. Although both methods involve improving the impact an area has on the health of the people in the space, there is a significant difference in the products and methods used for each operation. To sanitize a surface means to greatly reduce or kill the existing bacteria on a surface in a relatively short period. This is most often practiced in food-prep settings where the presence of contaminants are relatively low, and where the use of disinfectants would be harmful to people. For instance, establishments that serve food are required by law to sanitize their plates, utensils, glasses, etc. 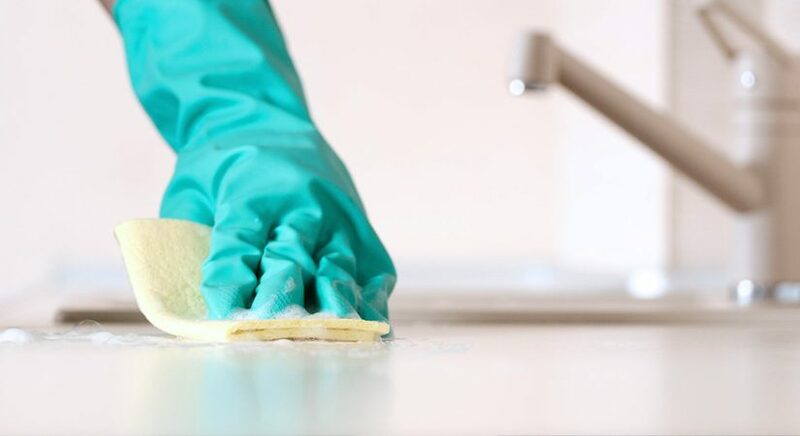 The prescribed standard for sanitizing is to remove 99.9% of the bacteria on an object or surface that will come into contact with living beings. It is important to note that this does not account for the elimination of viruses or fungus. These products are often in ready-to-use form, and include products like Betco’s Sanibet and NCL’s Spritz. Disinfection involves the use of a stronger solution designed to completely eliminate all bacteria, viruses and fungus from frequently touched surfaces and places where pathogens are likely to exist. The most obvious example is the use of disinfectants in hospitals and other health care facilities where bodily fluids are present. Please note that cleaning common soils is not a function of disinfection, which means that surfaces must be thoroughly cleaned before a disinfectant is effective. This is why disinfectant cleaners such as PowerQUAT and Pine SOL Disinfectant Cleaner are commonly used in commercial settings, eliminating the need of multiple products for one surface. Both sanitizers and disinfectants are formulated specifically to function as required, making it extremely important to read the label on the product in question and to follow the instructions exactly. A commonly made mistake when using concentrated products (products that require water) is the improper mixing of the solution. If a product is designed to disinfect at a ratio of two ounces of chemical per one gallon of water, this exact mix is where the product will most effectively perform the kill claims indicated on the product. Adding more product than indicated does not make the product more potent, and actually makes it less effective in the long run. Another important factor that is often ignored is dwell time. These times vary per product and targeted pathogen, however both disinfectants and sanitizers require some time for the product to sit wet before they achieve the desired effect. Historically, disinfectants have required approximately ten minutes of dwell time to meet their kill claims, but lately many chemical manufacturers are developing products that kill certain bacteria much more quickly. Lastly, disinfectants also require a thorough rinsing as well as being wiped down with a sterile cloth in order to completely remove potentially harmful material and to negate the possible negative effects that these products can have on humans. If you are simply looking to improve the appearance of a surface, cleaning is perfectly acceptable. If you’re looking to eliminate possible contaminants and improve the health of a given area, you’ll need to use the appropriate sanitizer or disinfectant for your situation. As with all commercial chemicals, it is important to closely follow the directions on the label in order to assure that the product will perform as expected as well as protect the user and other people who will come into contact with the surface. When used correctly, these products can greatly improve both the appearance and the health of your environment.